Johann Wolfgang von Goethe (August 28, 1749 – March 22, 1832) was a German polymath—a painter, novelist, dramatist, poet, humanist, scientist, philosopher, and, for ten years, minister of state for the republic of Weimar. Like Samuel Taylor Coleridge in England, Goethe was not only a gifted poet and writer but also Germany's first public intellectual. Thanks to his long life and boundless intellectual industry, he remained Germany's principle literary figure through a series of movements and upheavals in German literary history, beginning with the movement of German classicism in the late eighteenth century, continuing through the Enlightenment and the major period of German philosophy, and continuing into the Sturm und Drang Romanticism of the early 1800s. Goethe participated in all of these periods to varying degrees; in all of them, Goethe, more than any other author, was able to reach the masses of Germany with prose that was both elegant and readily accessible. His great creation, the retelling of the tale of Faust, who sells his soul to the devil for success and fame, became a kind of Enlightenment manifesto against the church and religion. Goethe's contributions to European literary life were immense throughout his career. His early novel, Der Leiden Junges Werthers, (The Sorrows of Young Werther) was so popular throughout Europe that for decades impressionable European men committed suicide from unrequited love in imitation of the novel's tragic protagonist. This clearly establishes that artists and literary figures should recognize their influence, and thus express their creativity constructively and responsibly. In his late career, his masterpiece, the epic poem Faust, would become so fundamental to German literature that many Germans would rank Goethe as the "William Shakespeare of Frankfurt." It is not an exaggeration to say that modern German literature begins with Goethe and that he ranks as one of the most important figures in European literature. 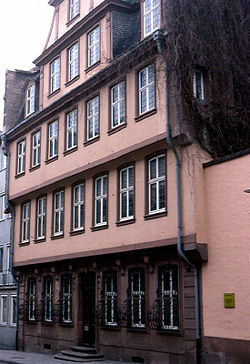 Goethe was born in Frankfurt am Main to a middle-class family. His father, Johann Kaspar Goethe, was a successful lawyer who had acquired enough wealth to be financially independent; he traveled frequently to Italy, collected paintings, and was fond of books and intellectual rigor. His mother, Katherina Elisabeth, was the daughter of a local mayor. She introduced the young Goethe to many connections in upper German society which would later prove invaluable in his development. Goethe would often return to warm reflections of his early childhood in Frankfurt among the Bürgertum, the "farming stock"—Goethe's affectionate name for the simple people around whom he grew up. His memories of Frankfurt would affect much of his future attitudes, in particular his belief that the soul is made of conflicting impulses—the intellectual, and the pastoral—both of which he experienced first-hand in his early life amidst the fields. In 1765 the young Goethe was sent off to study law at the University of Leipzig at the behest of his father. Goethe bitterly opposed the move. He wanted desperately to study classics at the newly-founded University of Göttingen. Goethe's father refused, but in the end it was to be for the best. Leipzig was—as Goethe would later call it himself—the "Paris of Germany." While there he would come into contact with countless minds of first rank, including the critic J. C. Gottsched, the (then wildly popular) poet C. F. Gellert, the novelist C. M. Wieland, the composer J. A. Hiller, and the archeologists A. F. Oeser and J. J. Winckelmann. Goethe visited Dresden, which Johann Gottfried Herder had called the "Florence of the North." The city was teeming with baroque art and sculpture, all of which flooded Goethe's impressions and set his imagination afire. During his Leipzig years Goethe began writing and publishing his first poems, which included the books Das Leipziger Leiderbuch ("The Leipzig Songbook"), Das Buch Annette ("The Book of Annette"), and Neue Leider ("New Songs"), none of which received very much recognition nor gave any hint of his great talent. Goethe took suddenly ill three years into his stay at Leipzig in 1768. He was rushed home and, upon his recovery, was advised by his father to resume his studies at Strasbourg. This would prove to be the major turning point in Goethe's career. While he was recovering Goethe began his first readings into mysticism and the occult, interests which were to preoccupy him for the rest of his life and which would find their ultimate form in his masterpiece, Faust. More importantly, at Strasbourg, Goethe encountered a very different kind of Germany. Strasbourg at this time was a German fortress-city lying right in the heart of a French-controlled province; quite unlike cosmopolitan Leipzig, the people of Strasbourg were decidedly and even aggressively Germanic. It was at Strasbourg that Goethe's taste in art and architecture moved away from the Roccoco and towards the Gothic. More significantly, it was in Strasbourg that Goethe first met the poet Johann Gottfried Herder. Herder would influence Goethe towards what was then the newest movement in German literature—the Sturm und Drang—literally, "Storm and Stress." Closely related to the English Romanticism of such poets as Lord Byron, Percy Bysshe Shelley, and Samuel Taylor Coleridge among others, the Sturm und Drang movement was concerned with wild and even fantastic emotion, the contemplation of nature and spirit, and an almost mystic interest in "primitive" literature, particularly Homer, the Psalms, and the (forged) ancient poetry of Ossian. During this time Goethe wrote some of his most moving lyric poetry, including what is perhaps his most popular love-song, Wilkommen und Abscheid ("Welcome and Farewell") written for one of the many milkmaids whom Goethe, throughout his life, would unsuccessfully woo. During his time in Strasbourg, Goethe began to write plays. Goethe was an avid reader of William Shakespeare, and he wished to bring the same energy of Shakespeare's words into the German language. He produced what is considered by many to be the first major work of the Sturm und Drang movement, the tragedy Götz von Berlichingen. Goethe quickly followed this up, in 1774, with the novella which many believe brought Sturm und Drang and German Romanticism into the foreground of European literature, Die Lieden Junges Werthers (The Sorrows of Young Werther). The book was immediately popular, making Goethe, who since finishing his education at Strasbourg had been employed at least ostensibly as a lawyer, an instant literary celebrity. In 1775 Goethe left Strasbourg for Weimar. He would remain there until his death, 57 years later, in 1832. Goethe had been fiercely criticized by some of his closest friends for his early work—Herder in particular wrote a scathing review of "Werther" in which he accused his former friend of lacking self-control. In Weimar he would temporarily slow down his output and concentrate on honing his craft. He spent nearly 20 years before publishing Wihelm Meisters Lehrjahre ("Wilhelm Meister's Apprenticeship"). This publication was an important contribution to the bildungsroman, and would signal the beginning of Goethe's maturity as a writer. 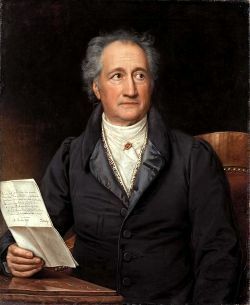 While at Weimar, Goethe began to distance himself somewhat from the radical Romanticism of his youth, opting for a more "objective" style that drew heavily on his growing interests in science. The poems he wrote during this period were remarkable for their treatment of nature as more than a reservoir of spirit. The older Goethe began to see nature as a force in its own right, capable of inflicting harm as well giving hope, and like man himself, beautifully unpredictable. In 1786, in the middle of this period of maturation, Goethe took his legendary journey to Italy. When he arrived there, he immediately threw aside his "Gothic follies" and embraced the art and sculpture of ancient Rome and Greece. Florence and many of the other most beautiful cities of Italy held almost no interest for him; he spent his time, almost obsessively, searching for the temples and structures of the ancient world, ultimately discovering Sicily, which he regarded as the hearthstone of European art, so closely did it resemble his image of Homer's Ithaca. While in Italy, Goethe also began the first of his major scientific writings, developing a theory of plant growth that would influence botany for generations. Out of his Italian journey Goethe produced his Römische Elegien ("The Roman Elegies"), Torquato Tasso, and the play Iphigene, modeled on the ancient legend of Orestes. Goethe would return to Italy again in 1790, though this visit would prove disappointing; having dabbled in painting all of his life, Goethe would decide in Rome that he was no match for Italian painters and abandon the art altogether. The French Revolution began a year earlier, and during the subsequent years Goethe looked on the ascendancy of Napoleon Bonaparte with increasing horror. 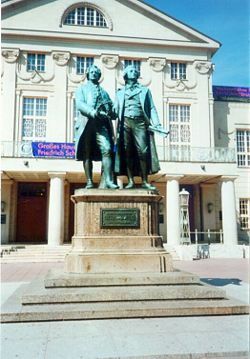 Goethe's return home to Weimar was alleviated due to his befriending of the poet Friedrich Schiller. The two would become close friends, working together for the coming decades in shaping Germany's literary future. Beginning in 1791, the two would collaborate to set in motion the movement known as German classicism. The classicists, in sharp opposition to the Romantics of the now aging Sturm und Drang, were interested in preserving the classic traditions of poetry and art. As he had for Romanticism in his early career, Goethe would again contribute what many consider to be the finest work of the movement, Hermann and Dorothea, one of his most beloved works. This work, explicitly modeled on Homer's Odyssey but in a German setting, was an attempt, as Goethe put it, to "produce a Greece from within." 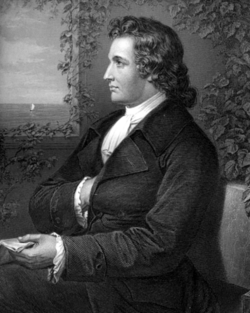 Like Schiller and the other classical German poets, Goethe would produce other works of such Hellenic inflection, though none except for a fragment of a longer work Achilleis would get very far before Goethe would leave his interests in ancient Greece behind, preferring, once again, to connect with the German-ness of his own people. He would also, in 1805, begin publishing his long scientific work on optics entitled Theory of Color, which would significantly influence German philosophy, particularly the analytical philosopher Ludwig Wittgenstein. Goethe, who by this time was already an old and famous man, would turn his attention to composing his largest, most challenging, and most powerful masterpiece, the epic dramatic poem Faust. Goethe realized that he was breaking with Schiller and with classicism in general by returning to the German legend of Faustus which could trace its roots back to the Middle Ages. While taking up this distinctly Germanic tale, he would do so with a rich understanding of the classical Greek and Roman traditions which Germany (like the rest of Europe) had inherited. Schiller referred to the work as Goethe's "barbarous composition," but nevertheless supported him, for the genius of the first volume of the work, published in 1808 as Faust, Erster Teil ("Faust, Part One") was immediately obvious. Here was one of the sharpest and most widely-ranging minds of the past two hundred years grappling with epic problems of philosophy and science, reason and faith in the midst of the greatest activity in the history of German literature and thought. In 1805 Schiller died, and Goethe came into contact with a new school of German Romantics (distinct from the Sturm und Drang movement of nearly a half-century earlier) who, in the absence of his old friend, heartened him greatly. Friedrich von Schlegel in particular, who celebrated Greece as the pinnacle of world culture, was a kindred soul to the aging poet. Their youthful interest in the literature of foreign lands inspired Goethe to develop his concept of Weltliteratur ("world-literature") which would become a goal for the rest of his life. He continued his work on Faust in earnest. By no means, however, was Goethe slowing down, despite his scrupulous concentration on the composition of his epic. During the 1810s and 1820s he continued to publish novels, including a continuation of his Wilhelm Meister series, Wilhelm Meisters Wanderjahre ("Wilhelm Meister's Travels"), an immensely popular work which contains Goethe famous reflection on America, Amerika, du hast es besser! ("America, you're better off!"). As a minister elected to public office in Weimar, Goethe would also attract hundreds of pilgrims who would come to hear him speak and ask questions of Germany's great sage. Months before his death, in 1832, Goethe finished the second part of Faust. He passed away at the age of 83, having left his indelible mark not only on Germany, but on the world. The most important of Goethe's works produced before he went to Weimar was his tragedy Götz von Berlichingen (1773), which was the first work to bring him fame, and the novel The Sorrows of Young Werther (1774), which gained him enormous popularity as a writer in the Sturm und Drang movement. During the years at Weimar before he met Schiller he began Wilhelm Meister, wrote the dramas Iphigenie auf Tauris, or Iphigenia in Tauris, Egmont, Torquato Tasso, and Reineke Fuchs. To the period of his friendship with Schiller belong the continuation of Wilhelm Meister, the idyll of Hermann and Dorothea, and the Roman Elegies. In the last period, between Schiller's death, in 1805, and his own, appeared Faust, Elective Affinities, his pseudo-autobiographical Aus meinem Leben: Dichtung und Wahrheit (“From my Life: Poetry and Truth”), his Italian Journey, much scientific work, and a series of treatises on German art. His writings were immediately influential in literary and artistic circles. The short epistolary novel Die Leiden des jungen Werthers, or The Sorrows of Young Werther, recounts an unhappy love affair that ends in suicide. Goethe admitted that he "shot his hero to save himself." The novel remains in print in dozens of languages. Its young, rash hero becomes disillusioned with society and by his irreconcilable love for an unattainable woman. The fact that it ended with the protagonist's suicide and funeral—a funeral which "no clergyman attended"—made the book deeply controversial upon its (anonymous) publication, as it seemed to condone suicide. Since suicide is a sin according to Christian doctrine, a clergyman should have attended the funeral service to condemn the act. Epistolary novels were common during this time, as letter-writing was the primary mode of communication. What set Goethe's book apart from other such novels was its expression of unbridled longing for a joy beyond possibility, its sense of defiant rebellion against authority, and, above all, its predominant subjectivity—qualities that pointed the way toward the Romantic movement. The next work, his epic closet drama Faust, was to be completed in stages, and only published in its entirety after his death. The first part was published in 1808 and created a sensation. The first operatic version, by Spohr, appeared in 1814, and was subsequently the inspiration for operas by Charles Gounod, Arrigo Boito, and Ferruccio Busoni, as well as symphonies by Franz Liszt and Gustav Mahler. Faust became the ur-myth of many figures in the nineteenth century. Later, the motif of selling one's soul to the devil for power over the physical world took on increasing literary importance and became a metaphor for the price of the victory of technology and industrialism. On occasion, the play is still staged in Germany and other parts around the world. Goethe's poetic work served as a model for an entire movement in German poetry termed Innerlichkeit ("introversion") and represented by, for example, Heinrich Heine. Goethe's words inspired a number of compositions by, among others, Wolfgang Amadeus Mozart, Ludwig von Beethoven, Franz Schubert, Hector Berlioz, and Hugo Wolf. Perhaps the single most influential piece is "Mignon's Song" which opens with one of the most famous lines in German poetry, an allusion to Italy: "Kennst du das Land, wo die Zitronen blühn?" ("Do you know the land where the lemons bloom?"). "Against criticism a man can neither protest nor defend himself; he must act in spite of it, and then it will gradually yield to him." "Divide and rule, a sound motto; unite and lead, a better one." "Enjoy when you can, and endure when you must." "Nothing human is alien to me." Lines from Faust, such as "Das also war des Pudels Kern," "Das ist der Weisheit letzter Schluss," or "Grau ist alle Theorie" have entered everyday German usage in much the same way that some of William Shakespeare's lines have entered into English usage. Furthermore I must confess to you that I have nearly discovered the secret of plant generation and structure, and that it is the simplest thing imaginable.... Namely it had become apparent to me that in the plant organ which we ordinarily call the leaf a true Proteaus is concealed, who can hide and reveal himself in all sorts of configurations. From top to bottom a plant is all leaf, united so inseparably with the future bud that one cannot be imagined without the other. He is credited with the discovery of the intermaxillary bone in humans, during 1784; however, Broussonet (1779) and Vicq d'Azyr (1780) had identified the same structure several years earlier. In the twentieth century, Goethe's Theory of Colors influenced the philosopher Ludwig Wittgenstein's Remarks on Colour, Werner Heisenberg and Max Planck have indicated the accuracy and suggestiveness of many of Goethe's scientific statements, and it has had a tremendous impact in other fields. It is difficult to overstate the importance of Goethe on the nineteenth century. In many respects, he was the originator of—or at least the first to cogently express—many ideas which would later become familiar to the modern age. Goethe understood that there was a transition in European sensibilities, an increasing focus on sense, the indescribable, and the emotional. This is not to say that he was sentimental or excessive; on the contrary, he lauded personal restraint and felt that excess was a disease: "There is nothing worse than imagination without taste." Goethe produced volumes of poetry, essays, literary criticism, and scientific work, including a theory of optics and early work on evolution and linguistics. He was fascinated by minerals and early mineralogy (the mineral goethite is named for him). His non-fiction writings, most of which are philosophical and aphoristic in nature, spurred on the thought of many philosophers, such as Georg Wilhelm Friedrich Hegel, Friedrich Nietzsche, Rudolf Steiner, among others. Goethe rewrote the formal rules of German poetry, helped to initiate literary Romanticism and German classicism, and embodied many of the contending strands in art over the next century. His work was alternatively lushly emotional, rigorously formal, brief and epigrammatic, and epic. He would argue that classicism was the means to controlling art, and that sentimentalization was a sickness, even as he penned poetry rich in memorable sentimental images. His poetry was set to music by almost every major German composer from Mozart to Mahler, and his influence would spread to French drama and opera as well. The Faust tragedy, written in two parts published decades apart, would stand as his most characteristic and important artistic work. Beethoven declared that a "Faust" Symphony would be the greatest thing for art. Liszt and Mahler both created symphonies in whole or in large part inspired by this seminal work, and Thomas Mann adapted the tale to explore the corruption of German culture in his 1947 novel Doctor Faustus. Goethe was also a cultural force, and by researching folk traditions, he created many of the norms for celebrating Christmas. He argued that the organic nature of the land molded the people and their customs—an argument that has recurred ever since, including recently in the work of Jared Diamond. He argued that laws could not be created by pure rationalism, since geography and history shaped habits and patterns. This stood in sharp contrast to the prevailing Enlightenment view that reason was sufficient to create well-ordered societies and good laws. We conceive of the individual animal as a small world, existing for its own sake, by its own means. Every creature is its own reason to be. All its parts have a direct effect on one another, a relationship to one another, thereby constantly renewing the circle of life; thus we are justified in considering every animal physiologically perfect. Viewed from within, no part of the animal is a useless or arbitrary product of the formative impulse (as so often thought). Externally, some parts may seem useless because the inner coherence of the animal nature has given them this form without regard to outer circumstance. Thus...[not] the question, What are they for? but rather, Where do they come from? This change would later become the basis for nineteenth century thought—organic rather than geometrical, evolving rather than created, and based on sensibility and intuition, rather than on imposed order, culminating in, as he said, a "living quality" wherein the subject and object are dissolved together in a poise of inquiry (the unity of subject and object, knower and known, was a theme of German philosophy after Immanuel Kant that was eventually established in Hegel's dialectic). Consequently, he embraced neither teleological nor deterministic views of growth within every organism. Instead, the world as a whole grows through continual, external, and internal strife. Moreover, he did not embrace the mechanistic views subscribed to by contemporaneous science, thereby denying rationality's superiority as the sole interpreter of reality. Furthermore, he declared that all knowledge is related to humanity through its functional value alone and that knowledge presupposes a perspectival quality. He also stated that the fundamental nature of the world is aesthetic. His views make him, along with Adam Smith, Thomas Jefferson, and Ludwig van Beethoven, a figure in two worlds: on one hand, devoted to the sense of taste, order, and finely crafted detail, which is the hallmark of the artistic sense of the Age of Reason and the neo-classical period of architecture; on the other, seeking a personal, intuitive, and personalized form of expression and polity, firmly supporting the idea of self-regulating and organic systems. Thinkers such as Ralph Waldo Emerson would take up many similar ideas in the 1800s. His ideas on evolution would frame the question which Charles Darwin and Alfred Russel Wallace would approach within the scientific paradigm. I bear with quiet resolve, just as a God commands it. These four: tobacco smoke, bedbugs and garlic and Christ. "More light," reportedly, Goethe's last words. ↑ 1.0 1.1 R. H. Stephenson, Goethe's Conception of Knowledge and Science (Edinburgh: Edinburgh University Press, 1995). ↑ Conversations with Eckermann (Jan. 4, 1824), translated by Wallace Wood. History of "Johann Wolfgang von Goethe"
This page was last modified on 11 May 2018, at 16:38.